Ferdinand Marcos, who thought of himself as a legal wizard, convened a nationwide Citizens’ Assembly purposely to ratify his Constitution. The old Constitution has the ratification mechanism which Marcos sidestepped. Under the pretext that resort to electoral ratification via the ballot is fraught with peril, given the countryside rebellion whereof he capitalized in his declaration of Martial Law, the best substantial compliance of popular consultancy is thru his brainchild, the Citizens’ Assembly. His Solicitor General, the legendary Titong Mendoza, marshaled his master’s arguments in his respondents’ Brief ranged against the Memoranda of Jose W. Diokno, Ambrosio Padilla, Salvador Laurel, Joker Arroyo and the best and the brightest luminaries in the old dispensation: Lumang Lipunan. Martial Law, of course, had FM consolidated the powers of the Presidency. The Supreme Court will soon mint the infamous Ratification Cases (Javellana vs Executive Secretary). Declaring that his brand of Martial Law is patterned with that of Abraham Lincoln’s, “the Courts are never shut down” and citizens can still avail themselves of “free access” and enjoy their myriad sacramental services under the fundamental law. He boasted that his rule is the oxymoronic constitutional authoritarianism. There are hold outs in the High Court however: Roberto Concepcion, Jose Bambino Luis Reyes, and Claudio Teehankee. These jurists however know that however their opinions are written, Marcos, with all his blandishments that he’s submitting his fate to the Supreme Court, knew that he has the numbers. And so it came to pass. It was the beginning of the unsurpassed record of Titong Mendoza of legal triumphs unblemished by reversals. The Supreme Court, packed by Marcos’ classmates, acted as the confirmatory agent of the President for the next 15 years from September, 1972. This was never lost to Chief Justice Concepcion and Justice JBL Reyes. Forthwith, they resigned from the High Court. No amount of dissent can reverse the tide of Marcos Law. Concepcion and Reyes were mindful of the instructions coursed by Marcos thru his Sol Gen on the sly to the compliant Justices who were showered with perks and platitudes. The duo would never have none of these. Private life and the academe are much more attractive habitat that the exalted office of a High Court under duress. Perhaps Chief Justice Ma. 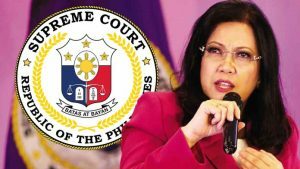 Lourdes Sereno, Justices Marvic Leonen and Antonio Carpio should learn from these leaves of historical sidebars. Right now, the CJ is the subject of a barrage of presidential ad hominems, legislative inquiries, and a chain of complaints from groveling factotums of the President. Why suffer the aggravation? “Nobody deserves the rambling of a fool,” one wise man said. Let the President packed his San Beda Supreme Court with his choice appointments. For our part, we ignore the SC altogether, just like what we did to the Marcos SC of the past. Who can remember the names of those pseudo-illustrious jurists named by Marcos during his watch? One year into office, does one remember Rody’s fresh appointments to the Supreme Court? All they have to do is enjoy the perquisites of the position, for all we care, and let them regurgitate by way of cut and paste, the wisdom of Renato Corona.